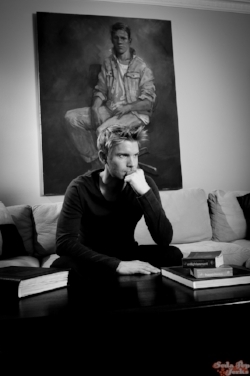 "Hunter Lee Hughes is an award-winning actor-director whose debut feature film "Guys Reading Poems" screened at eight international film festivals, winning three awards. 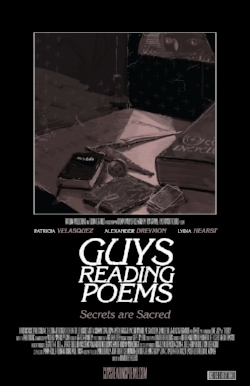 The film follows a resourceful boy who creatively uses poetry to survive being locked in a box by his disturbed mother. Hunter’s previous directing effort was the comedy narrative webseries "Dumbass Filmmakers! ", launched in 2012, which won four awards at L.A.WebFest, including “Outstanding Directing in a Comedy Series.” Hunter also wrote and produced "Winner Takes All", which screened at ten international film festivals before being acquired for distribution as part of the Black Briefs collection of dark short films. He is currently developing his second feature film, "Inside-Out, Outside-In." Hunter’s two plays, "Fate of the Monarchs" and "The Sermons of John Bradley", were mounted in Los Angeles, with "Fate of the Monarchs" being chosen as “Critic’s Pick” by BackStage West and "The Sermons of John Bradley" winning “Best Leading Actor in A Drama – Male” by StageSceneLA.com for the 2008-2009 Season." Please join us at the Breck Film Fest in welcoming Hunter as our "Filmmaker of the Month" and get to know a little more about this talented artist through his interview below! Lots of people start. A lot fewer keep going. There's an old cliche that applies here. I'm not sure who originally said it but it goes something like this, 'To be 20 and a poet, is to be 20. To be 40 and a poet, is to be a poet.' The same applies to filmmaking or any career in the arts. As a young man, I found myself in Germany for eight weeks, sort of drifting in my own life. I went to see a matinee screening of Lars Von Trier's DANCER IN THE DARK. The only other people in the theatre were two German ladies in their 70s. The film devastated me. By the end of it, I was sobbing uncontrollably in a public venue in a foreign country. The protagonist - at great cost to herself - commits to finding a way to restore the eyesight of her young son. Something about her commitment to her son inspired me to recommit to my creative life. So that was probably the most influential film in terms of my life. In terms of films I admire the most, I love ALL THAT JAZZ, HOWARDS END, WINGS OF THE DOVE, CENTRAL STATION, NIGHTS OF CABIRIA, RUNNING ON EMPTY, BULLY, WORKING GIRL, SUNSET BOULEVARD and HISTORY OF VIOLENCE, just to name a few. There are many more! I love that moment when we've just pulled off a really difficult shot, everyone working together - the actors and crew. I guess, in a way, what I love about that moment - achieving the shot we thought was almost impossible, too many moving parts, too tricky for the actors - is that it reveals the underlining camaraderie that exists on a set when everybody's motivated to make a quality film. To have a feeling of enthusiasm and goodwill among artists working really hard and working on a team....that's very satisfying. Why did you choose to submit to the Breckenridge Film Festival? I'd heard wonderful things about the festival from a producer friend of mine. And he was right about you! I also love the idea of festivals that allow you to experience a different environment, so the natural beauty surrounding Breckenridge provided a sort of lure. Films - and the effort it takes to make them - can be very stimulating, so I think that the mountains and landscape in your area are a way to reconnect with nature. So your festival provides the mental stimulation for the mind in terms of the films but also a relaxation for the body and spirit, in terms of being surrounded by natural beauty. When I returned to Los Angeles, I felt refreshed. I'm developing my second feature film, "Inside-out, Outside-In." It's about a straight actor and a gay film director who realize they may be reincarnations of soulmates who once lived in a mysterious monastery in ancient India. I'm calling it a "reincarnation romantic drama." It's the most ambitious project I've attempted to date, in terms of both budget and scope. But the film asks the kinds of questions I think we need right now. Do we have souls that transcend any one place and time? What is the nature of love? How is love formed, through physical attraction that emanates from our sexual desire or from a spiritual connection or both? I've started a blog at insideoutthefilm.com so that other filmmakers - or anyone interested in the process for that matter - can learn how I'm building this second feature from start to finish. I sort of see this film as an experiment with what I call "open source filmmaking" because I'm opening up my process to the audience before and during the making of the film, not only in retrospect once it's complete. I believe in this model because it empowers your investors to know what's going on and it also helps to pre-build an audience for the film. On a happy note, we've attached Rex Lee ("Entourage") to play the role of Hollywood agent Steven Park in the new film. So...you know Rex came with us to Breckenridge last year - maybe we can hang out again! I love working with Rex and I think people will be super impressed with him in this role. He's playing a Hollywood agent, familiar territory for him, but in a dark version of Hollywood that reveals some of the consequences that can accompany success here. When I was starting out, even a low-budget film was too expensive as a cauldron for experimentation, at least for me. That's why in the beginning I turned to theatre and a one-man show, just to build a creative project from the ground up. But now...there's no excuse. Everybody can make a relatively low budget short film or webseries with a little cash and a little ingenuity. So just start making films. Try to work within your means in the beginning. So even if you shoot with an iPhone in your apartment, make a film. Recruit friends and talent from the community and see how it goes working with them. You're bound to click with some of the people and learn a lot. Then, make a second uber low-budget film, recruiting some new people and some that clicked with you on the first film. Keep squirreling those expensive scripts away and tinkering with them, but do go out and make three or four films that are achievable through your own funds. Take the plunge and learn from doing. Once you build some momentum, the next steps will start to reveal themselves and will be unique to every filmmaker. The industry is fraught with so much rejection. Mostly, it's you receiving the rejections. Then, sometimes, you have to reject others, which honestly doesn't feel a whole lot better, especially when you truly like and admire an artist who is simply not right for your film. So if I could wave a magic wand and just have it revealed - okay, Betty needs to be working with Sam and Donald over there and Fred, he needs to be cast in this film with Patrick and Wilbur without anybody involved having to go through a bunch of rejections to figure that out, then I might be tempted to go ahead and wave the wand. Since that can't happen, I'd vote for everyone striving to treat each other a little bit better in an industry whose sheer numbers and intense competition make it difficult enough already. Who is the most influential person you have met in the industry that had some impact on your work? And what impact did he/she have? For me, that person is Mardik Martin. I couldn't afford film school, but fancied myself a writer-director. Mardik, who co-wrote "Mean Streets" and "Raging Bull" hired me as his writing assistant and paid me $20 an hour to basically learn the craft of screenwriting from one of the living legends in the field. He taught me an effective method for developing and writing screenplays. He illuminated all the traps. He taught me how to do research. And he gave me the lay of the land in terms of the personalities that dominate the business. I am forever in his debt.